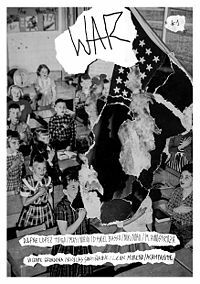 WAR - ZineWiki - the history and culture of zines, independent media and the small press. WAR is a contemporary fanzine published in Argentina focussed on uncontrolable actions, ideas and trash, edited and curated by the photographer Nicolas Santiñaque. Besides having the online version, each number has a limited edition, crafted, numbered and silkscreened. WAR#1: Dafne Lopez Toigo / Mati Nuevo / Daniel Basso / Niki Noto / M. Hinostroza / Vicente Grondona / Nicolas Santiñaque / Leon Moreno / Acampante. WAR#2: Yamandu Rodriguez / Hef Prentice / Antonio Savasta / Nina / Rafael Aladjem (Homoxidal500) / Boom Boom Kid / Scorpion Dagger / Zoelandia / Patricio O Connor. WAR#3: Gustavo Eandi / Luz Ferrari / Gorsad Kiev / M. Pacho Lopez / Santiñaque / Ariel Pukacz / V. Tettamanti / Markie Sparkles / Camila Marconi. WAR#4: Bruce LaBruce / Pedro Luque / Kris Tsai / Jorge Pomar / Amit Ben Nun / Dario Suarez / Ariel Bassano. This page was last modified on 22 September 2016, at 15:13.